Learn how to play Should I Stay Or Should I Go fast! This 10 minute video shows you all the chords and riffs for this classic song, with on-screen chords and tablature. Includes 'soundalike' performance of the complete song. Plus: a sheet music booklet containing full notation, tablature and complete lyrics. 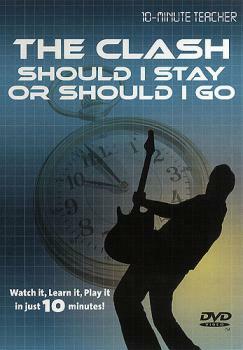 Here's absolutely everything you need to play Should I Stay Or Should I Go in one exciting package in just 10 minutes! Watch it, Learn it, Play it, in just 10 minutes!